I just made these last night and substituted turkey bacon and it was AMAZING. Eating leftovers for lunch right now. THANK YOU! I just made this receipt last night and I am absolutely hooked! Was a little too hot (even with the seeds out of the jalepeno for my 9 year old daughter, but both my hubby and myself absolutely loved this! This is my first time doing a skinnytaste.com recipe and I am just amazed with all of the flavor. I am not a creative cooker, so I am very excited to see what else I can find on here to make. THANK YOU! AMAZING! I have never posted a review on any recipe before probably because I never cook. But made this last night for dinner it was amazing and pretty simple! I used turkey bacon and of course added more pieces then recommended because bacon makes everything better! Could you use laughing cow cheese instead of cream cheese just like the buffalo chicken recipe on here? I made this last night and was happy with it. I made the mistake of not getting enough chicken at the grocery store though. The recipe calls for 8 3oz pieces of chicken, so I though "Hey, that's about a pound and a half-ish, I'll just get one container of a pound and a half." I should have gotten two containers, because I only ended up with four pieces of chicken and a lot of mixure left. Derp. The only thing I did different was I brushed on the oil/lime mix with a basting brush instead of dipping it, for neatness. When I make this again (and I will) I think I'll pound out the chicken (just a little) to make it more of a consistent thinness. I think it will provide a bigger surface to spread the mixture too. FANTASTIC! Made these for an early Cinco de Mayo dinner! Will be making again, for sure!! I made this on Sunday for dinner on Monday (I left the breadcrumbing step to do right before) and it was utterly delicious. I'm not positive about the points – I must be misunderstanding some part of that – but regardless it was so good! Seriously delicious. We froze half to have on another occasion and I can't wait to eat this again! 5 STARS—I made this for dinner tonight and it's awesome. I added a little bit of TJ's roasted peppers & onions frozen veggie mix to the filling, and I coated the chicken in crushed tortilla chips since I didn't have breadcrumbs. Don't skip the bacon, it really adds a nice smokey note to the dish. I served it with tortilla chips and a red cabbage salad with roasted corn, black beans, tomato, cilantro and lime juice. Best recipe i've ever made on here! and thats a lot! Thanks Gina!!! I cannot wait to try this! What kind of breadcrumbs do you suggest? These are totally awesome!!! I have lost 25 pounds now with weight watchers and I thank you so much for helping with great recipes! I know this post is on the old side, but I made this for dinner tonight and it was delicious! I subbed plain panko for the breadcrumbs because that is all I had, but it still came out wonderfully! It's one of the hubby's new favorite recipes! 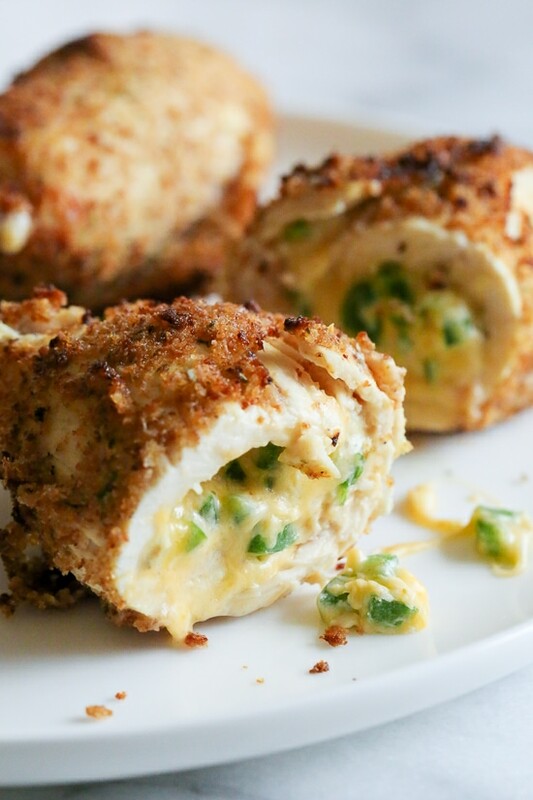 I have been craving jalapeno poppers ever since I made your baked version for a luncheon 2 months ago (everyone raved about those by the way). This chicken hit the spot! My stepdaughter got sent home sick today, vomiting, she went straight to bed and got up about 30 min after dinner was done and begged for some chicken! Lol Obviously it was a hit all around! when they said the way to a mans heart is through his stomach, this is the recipe they were talking about! This was amazing. Like, really amazing. I made it last night and my boyfriend and I devoured our portions in literally two minutes. Thank you for making me seem like a good cook! Made this tonight and came right on here afterwards and pinned it and sent it to my friends doing weightwatchers. This is one of my favorites from the site, SO good. And I am STUFFED for 9 points! So delicious! Definitely will make this one again. We paired it with sweet potato fries…not the healthiest option but yummmm! Made these last night. Absolutely amazing! We used planko crumbs instead of italian bread crumbs and the crunch WAS awesome. I only had one chicken as we served it with couscous and I got very full. I've been excited for the left overs since last night. So happy I found this recipe, it will definitely be made again! Made this last night. Absolutely amazing. I left the bread crumbs off to keep it low carb and used turkey bacon instead of regular. Very very good! YUM! 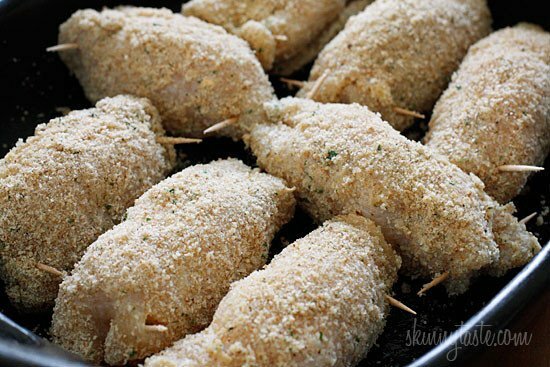 I used panko breadcrumbs instead of Italian, and cooked the chicken on a cooling rack in the oven– soo crispy and delicious! My husband loved the filling so much he had me make extra the second time so he could eat it straight out of the bowl 😛 Thanks so much! Made this last night but skipped the breadcrumbs, just baked. SO GOOD! 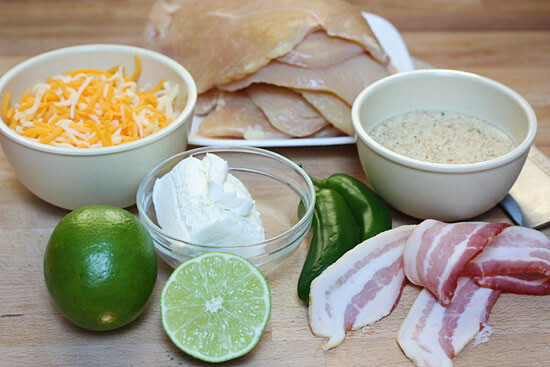 absolutely loved the kick of the jalapenos and the flavors compliment the chicken perfectly! Another great recipe to add to my tops! Made this today, and it was amazing! Although, when I put this all into the recipe builder for WW, it said it was 10 pts for the same serving? Could it be because I used panko? Either way, absolutely AMAZING!!!! Recommend to anyone! We Loved it!!!!! Thank you for sharing. I left the jalapenos out of the kids and my husband and i had extra with ours. OUTSTANDING!! I just made these and they were amazing. Even my picky boys ate and loved them. The filling did ooze out a bit, but the part that oozed out got nice and brown and tasted wonderful. Love your recipes. Everything I have tried has been excellent! Made this tonight….YUM! Like a previous commenter, I also served it with the fiesta rice, great combo. Kind of a lot of prep work for a work night, but with a good payoff! Will definitely make both again. I made this last night and it was delcious! I accidently put the lime juice in the cheese mix rather than with the oil but it still tasted great. Super filling and was a hit! I made these last night. I think next time I will have the butcher pound my cutlets a little. They didn't roll up very well and my filling was coming out, so I could only use 1/2 of the filling. BUT I persevered and they are really delish. I want to try them again with all the filling this time. I also used Italian panko. 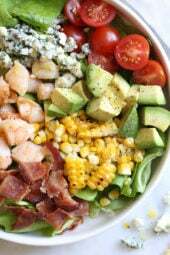 Great recipe and I really love this site. You use real ingredients and that is very important to me. Thanks Gina! I loved this recipe! Definately saving this in my recipe box. I just made this last night and it turned out wonderful. I used laughing cow queso cheese and it added even more flavor, thanks for the idea! Had this tonight. Didn't come out exactly like the picture but still tasted great! The jalapeño gave it a great kick and wasn't too spicy. Will be making this again soon! I made these for dinner without the bacon and shollots, added regular onion instead and they were absolutely amazing! My boyfriend was shocked that he could eat so much cheese and still be within calories. I bought a pack of 6 thin slied chicken breasts so each had just a little extra stuffing. This is very delicious! I made it two nights in a row by request. Love the lime! Thanks for sharing! We made this last night and loved it!! I just discovered your website and made this tonight for the family. OH MY GOODNESS, it was soo delicious!! This will definitely be roatating back into our regular menu. Everyone loved it. Just made this tonight and all I can say is Wow! Thank you so much Gina for inspiring us to cook healthy and delicious food. I have used many of your recipes over the past year which have helped me on my WW journey to lose 80lbs! This is one of my new absolute favorite recipes. My whole family loves it and requests that I make it at least once a week! Thanks for the awesome recipe. Thanks Gina. i agree, you are a genius! My husband absolutely loves this dish. i make the Fiesta Lime Rice as suggested. Made it just now. Put it in fridge and then all i'll have to do is pop it in the oven when we wanna eat tonight. I make great recipes all the time but rarely remake them cos I'm always wanting to try something new. This, however, I make often. I prefer it with whole foods thinly sliced chicken. Sooooo yummy! It was very filling too. Made it with some fiesta lime rice and it totally fulfilled my Mexican craving! Delicious! I made this tonight and my boyfriend said it was so good he could eat every piece! Thanks for the great recipe! Made this dish on sunday- it was realy good!!!!! Found this recipe on pintrest. I tried it and I loved it! So delish! My husband LOVES poppers so I thought I would try this tonight. He LOVED it so much he informed me that it was in his top ten. I figured that meant he wanted it in our regular rotation, but he stopped me to clarify. He thought it was one of the top 10 recipes he has EVER had, including restaurants and his mother. WoW! Thanks for the recipe I foresee us making this recipe over and over and over again. My husband and I have made this several times now, and we agree it is the BEST chicken recipe we have. Thanks! Your recipes are the only ones that I stick to 100%.This is now a weekly recipe in my house! Thank you. 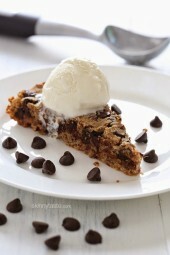 This recipe is absolutely fabulous! Since I've found it (two weeks ago) I've made it twice, can't get enough! My grocery store has Perdue thinly sliced breasts so I just use them but typically only 5-6 in a package. 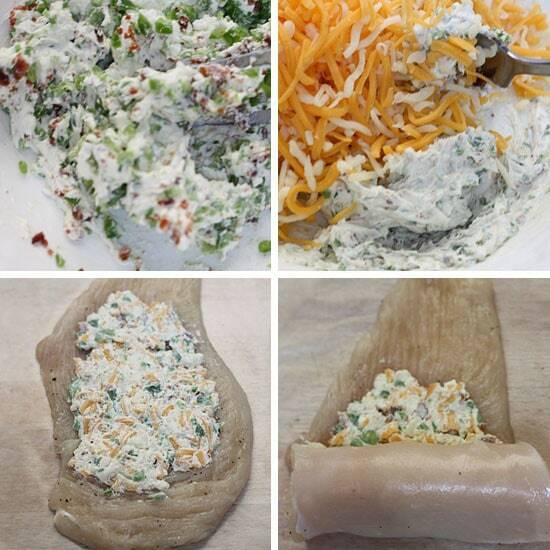 I make the filling the same amount and any leftover I put in a small bowl and put it in the oven for 10-15 minute and it makes an amazing dip! 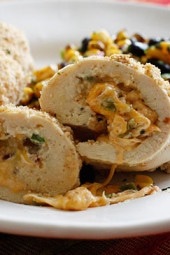 I am headed to a party this weekend and might just make the filling in a dish as a dip for the party! This was delish! I didn't have any cream cheese on hand so I used the Laughing Cow cheese spread and it was heaven! 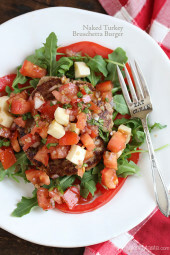 Gina, you totally RoCk and can't thank you enough for your creative, healthy recipes. Made this last night with the fiesta lime rice. WOWZERS!!! Normally I avoid jalapenos, but my boyfriend loves them so I thought it'd be a nice treat. I LOVED THIS DISH!!! The jalapenos (minus seeds) added awesome flavor and warmth without burning your mouth out. Unbelievably tasty! And the rice paired perfectly with the chicken. Definitely making this one again! If you can believe it, this recipe got my husband in the kitchen and cooking. He prepared it all himself..and followed your recipe exactly. It was to die for! It was SOOOO good. He was so proud of himself. Please keep the "husband friendly" recipes coming! I agree with JesseGirl – briefly sauteing the jalepenos calms the heat and sweetens them a bit. In an effort to make this recipe gluten-free, I tried it without the breadcrumbs. It turned out a bit too tart for me, so I think I might try adding some sugar-free sweetener to the lime juice-olive oil mixture next time to make it taste like "margarita" chicken. Filling was great though. Thanks for the recipe! 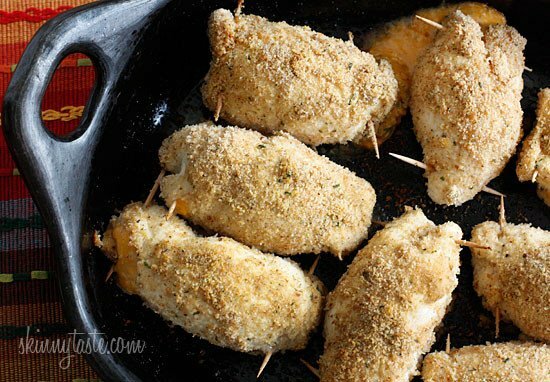 Where can I find the recipe to the side dish pictured with the chicken? This is one of my favorite recipes. I dont use bacon or scallions and I use part skim mozzarella cheese and panko breadcrumbs. One of the most delicious things I have ever tasted in my life! This is our new favorite recipe. Making it again tonight! I made this chicken tonight and it was delicious! I thought I may taste the lime on the chicken but you couldn't really at all. It was just really, really spicy because I didn't take the seeds out of the jalapenos, which I will probably do next time I make it (which will be soon!). Is there a big difference in Calories if I use a 4oz Chicken Breast instead of the 3 oz Breasts? I made this for dinner last night and had the left overs for dinner tonight. Super good both nights! It's on my regular menu now! THANKS! Made this for the second time today and my boyfriend and I absolutely love it. It's so good and it's one of those recipes where you can't it's skinny. I didn't have bacon so I added chorizo instead and it worked absolutely great. The smokiness and spices of the chorizo really worked well with the cheese. Thank you again for such an awesome recipe and I can't wait for your cookbook to come out! I made this the other night for my boyfriend with your oven baked onion rings and he LOVED it! It wasn't difficult at all to throw everything together and it tasted great. I'm relatively new to this site and so far I have NOT been disappointed. Love it and the daily recipes that pop up on my Facebook! DELICIOUS!!! My hubby took the leftovers to work the next day! 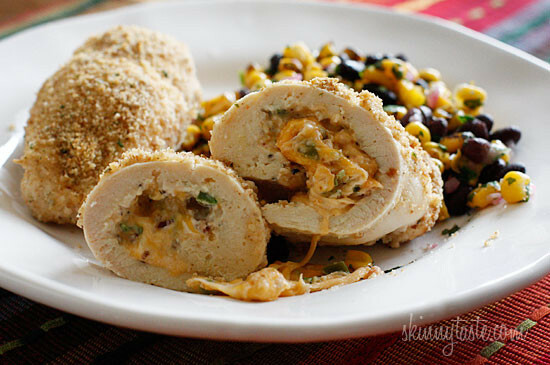 Just made this for the second time tonight, I love all your stuffed chicken recipes. I made these tonight, and they were yummy! A bit spicy for me, probably because I kept some of the seeds in for my hubby. He loved them. Ate four. I used panko breadcrumbs, but 1/2 cup wasn't enough. I probably used close to a full cup. I used turkey bacon because it's what I had on hand. We couldn't really taste the lime, not sure why not. Maybe because of the panko? I had my hubby make me cutlets from the breasts of a whole chicken I bought, and now I'm making your stock recipe with the carcass. Well, it'll be stock, not broth, but yummy all the same. I think next time we will cook the jalapenos a little. They were a tad crunchy for us. Delicious recipe. Used turkey bacon and subbed corn flake crumbs for half the breadcrumbs. 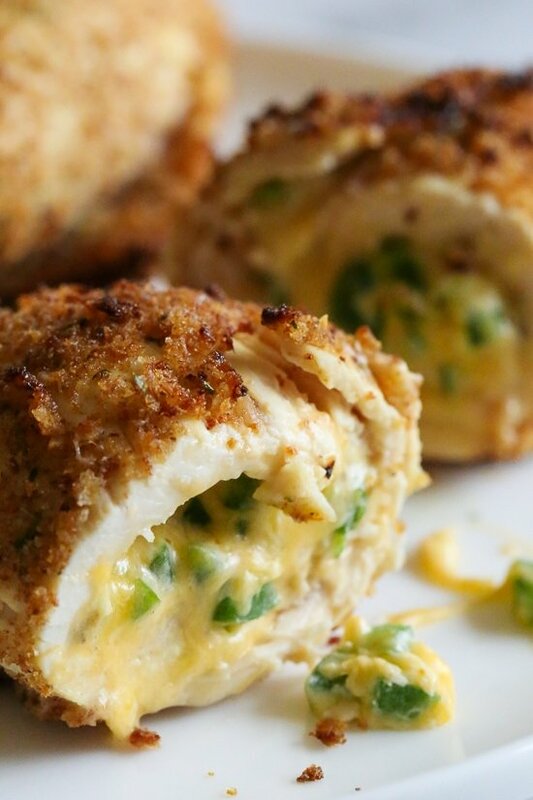 Not sure which is better…this recipe or the blue cheese buffalo stuffed chicken. YUM. My husband is super picky and he loved it. I didn't have cream cheese so I used light Laughing Cow swiss wedges and a little sour cream. Fantastic! Thanks Gina! My husband loved this, but I thought it was just okay. I didn't like the way the lime juice tasted, so if I do make this again, I will use just oil or oil and egg whites. I made this recipe last night and it was AMAZING! 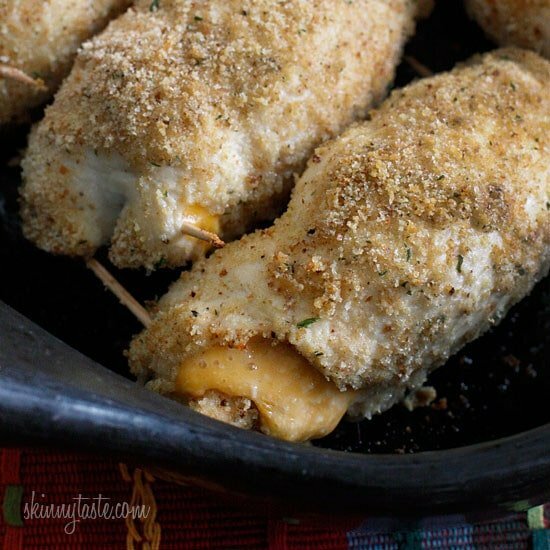 I made a few changes to the recipe mainly because I had just made your jalapeno poppers and wanted to use up for ingredients. I used panko crumbs instead of bread crumbs, regular cream cheese because that was what I had on had, and extra scallions to use up the rest. I loved this recipe so much and my boyfriend says he wants to eat it again soon! Next time, I will add a little cayenne pepper to the lime mixture to add a little heat on the outside of the chicken. I was surprised how NOT spicy this dish is and we LOVE spicy so cayenne is a must in my pantry! Thanks for the recipe! WOW! This was so awesome. My husband said this was his new favorite kind of chicken. I made it with the Fiesta Lime rice and the entire meal was a hit! Thanks Gina!! I have made this recipe SO many times now….it's one of my defaults for impressing guests! (And they don't even know it's skinny!) Thanks Gina! I made this last night, and it was so good!!! It was my first skinnytaste recipe and I was so impressed! My husband is so sick of feeling like he is on a diet too. Your website is helping me bring the food we love back into our house without the guilt! I made these the other night for 3 hungry boys and they could not get enough of them. They couldn't even tell that they were "skinny" thanks for all your wonderful recipes! This was delicious and turned out great!! My husband loved it! I am so excited to try other recipes from your website! Delicious as usual Gina! You are truly my weight watchers life saver! This is one of my new favorites! This was absolutely delicious. My husband liked it too. Will definitely be making again! Instead of breading them I left the bacon out of the filling and instead wrapped it around the chicken roll and threw them on the grill then brushed a bit of BBQ sauce on them! Gracious it was good! Thank you for this one! Keeper! i made this in a pork roast. it was great. will make again! Fixed this for my boyfriend tonight…..said it's the best thing I've made so far. It was awesome!!! just put them in the oven. This is my second time making them. yummy! I just want to thank you for all the work you put into this site. I started Weight Watchers again about 2 months ago and having your recipes available has made it so much easier. I have made so many of your recipes and they have all been delicious and I've lost 11 lbs, so far. I made this recipe for dinner this week and oh my goodness, was it delicious. My husband actually put his fork down in the middle of dinner and said, "you will be making these again, right? They are amazing!" This is coming from a guy who really is not a foodie (unless it comes to cookies and cake). I had to fight over the left overs because he wanted them all for his lunches for the week. Thanks again. I don't know what I would do if I hadn't discovered your site. My boyfriend and I made these last night, they were SO GOOD! We couldn't get enough. Thanks! I made this today… Yummy! I used mozzarella because cheddar is not easy to find where I live. I only used 2 jalapeños. I used lemon instead of lime (I always do that) and I added the zest to the breadcrumbs. I ended up with a few tiny breast pieces that I couldn't roll so I just breaded them and put some of the cheese mixture on top, those browned really really nice I might try doing that instead of rolling next time. Thanks Gina for all your recipes, I've been trying at least one of them every weekend for the last month or so and I am yet to be disappointed', I have made the buffalo turkey burgers a few times, so easy and tasty. My daughter made this last night for dinner and it was delicious. Instead of purchasing a whole package of bacon (which we usually don't eat) she used a bacon bits pkg which worked well. I made this last night, It was really good, husband liked it too! And he is not a big chesse fan. Although I cooked it a couple minutes too long, the cheese came out on the sides. But, I didnt think the way I toothpicked them was right… Regardless it was refreshing and good! Amazing! So glad I found this website! I have no idea how no one has commented on the burning of their hands after chopping the jalapenos, but my hand is burning like crazy right now. WEAR GLOVES. PLEASE. DO IT. You will regret not wearing them. OMG!! this was so yummy! Everything you touch turns to deliciousness. Thanks for all the recipes. Keeps dieting a little easier when you have so many great yummy recipes to choose from. Has anyone else done this, but made it low carb by omitting the panko/topping entirely? That would be the way I'd want to do it for me and my hub.